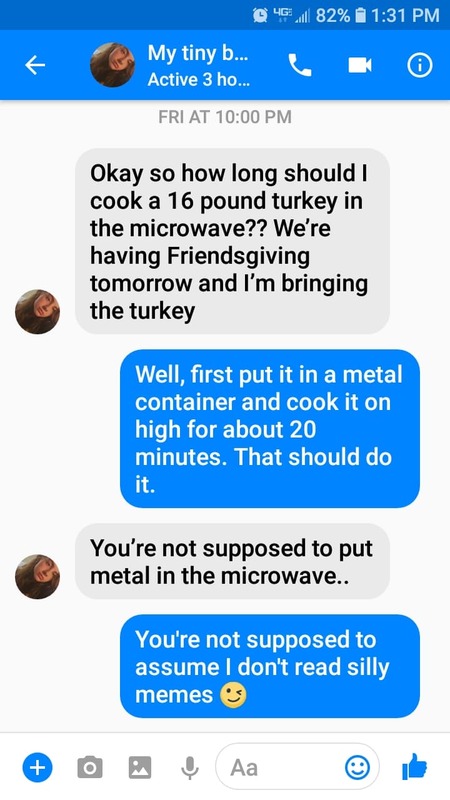 Kid who lives out of the house texts mom or dad saying that they are going to be going to a “Friendsgiving” where they have been tasked to bring the turkey. Of course they live in a dorm or similar place which doesn’t have the capability to cook it in an oven like is proper. 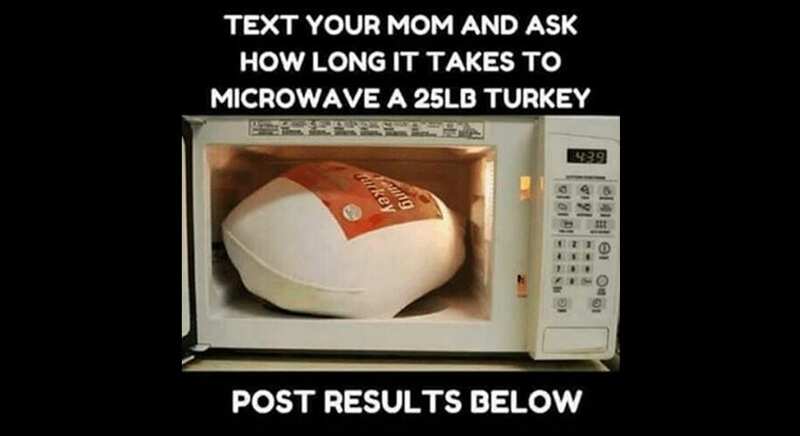 Instead they are going to use the microwave and need advice on how to cook a 25 pound turkey in the tiny magic box. If you read any of the results of this prank the comments are hilarious. Of course since I am on social media I have seen this and was aware. When Emma, who is away at college, texted me asking me if I could give her advice on it, I already knew what she was up to. She needs to get up earlier in the day to pull one over on me. 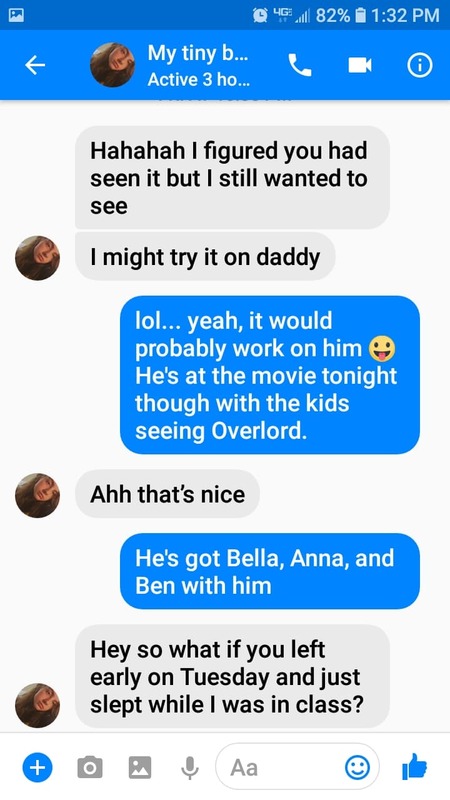 Her father on the other hand was the perfect target! “Call me.” Oh my gosh, just those two words get me laughing again! So Emma called him and asked his advice. He told her he’d call her back. Then he called me. I swear I am still laughing at the conversation. Mike, “Do you know what your daughter is trying to do? 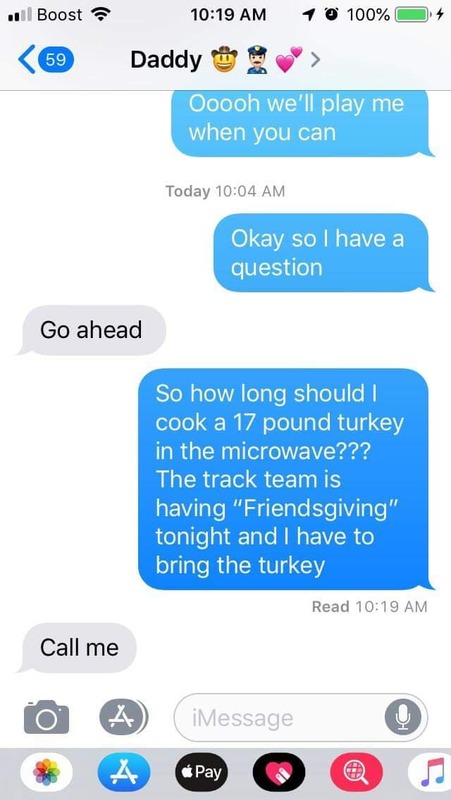 She texted me saying that she is going to a Friendsgiving for the track team and that she is going to bring the turkey. She said she needs to know how long to cook it in the microwave. Can you believe that? I told her that she can’t do it. I told her that it would get all rubbery. I told her that she wouldn’t even be able to get the skin crisp. She asked if she could just peel off the skin and cook it. What in the heck is wrong with her? Seriously, she wants to cook this in the microwave. I’m not sure how she got the job of bringing the turkey! I told her I would call her back. I wanted to tell you about it.” He continued on with shock and disbelief at how we had failed our child to where she would think she could cook a turkey in the microwave. I choked a little on the drink I was drinking because I was laughing so hard. We hung up and he called Emma back and told her to get a notebook so she could write down the notes he had for her. He proceeded to give her crazy instructions before telling her that he knew it was a joke. Y’all, I laughed for 10 minutes straight! I had tears from laughing so hard. Mike is now on a mission to get her back. If you have ideas, send me a message! I’m sure when he does it will be good. I expect to laugh again until my sides hurt! I’m picking Emma up tomorrow from school and I can’t wait to laugh about it on the way home and to see Mike’s reaction when she gets home. I love my family. I love that we can laugh and play and just have so much fun together. What a great way to start our holidays.